It’s been ages since we posted a recipe! We have been so busy taking care of bubs with the absence of grandma who wielded her magic wand daily to ensure that everything ran smoothly. In the months since she returned to Jamaica, it’s been rather crazy around here. But he is happy and healthy and nursing for all of the Americas, even if we have struggled with sleep deprivation and being a little overwhelmed at times. He has been worth every minute. Since we have decided to exclusively breastfeed for the first 6-8 months, it is useful for nursing mothers to consume galactogogues (herbs and other substances that promote lactation) to keep supplies up for the growing needs of a baby. We have also been cooking lots of soups and porridge in our kitchen. Every grandmother will tell a breastfeeding mother to have lots of both. 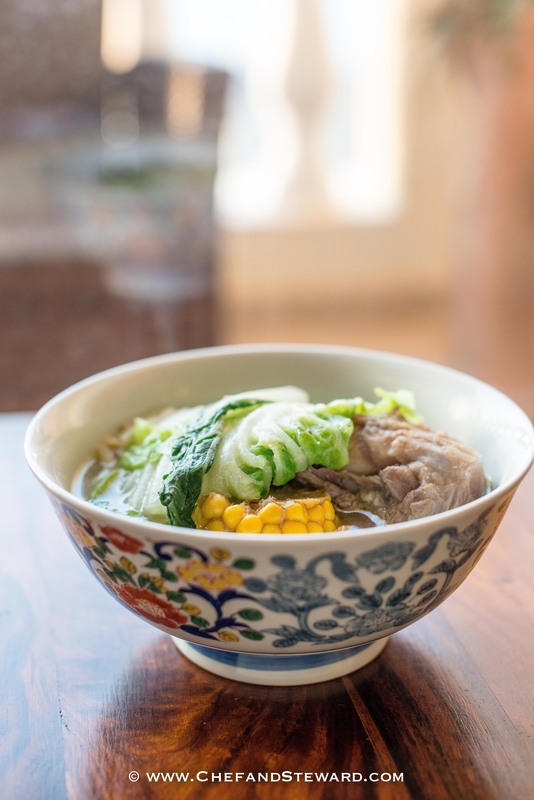 Using a bone broth stock base amplifies the nutrition in soups even more. 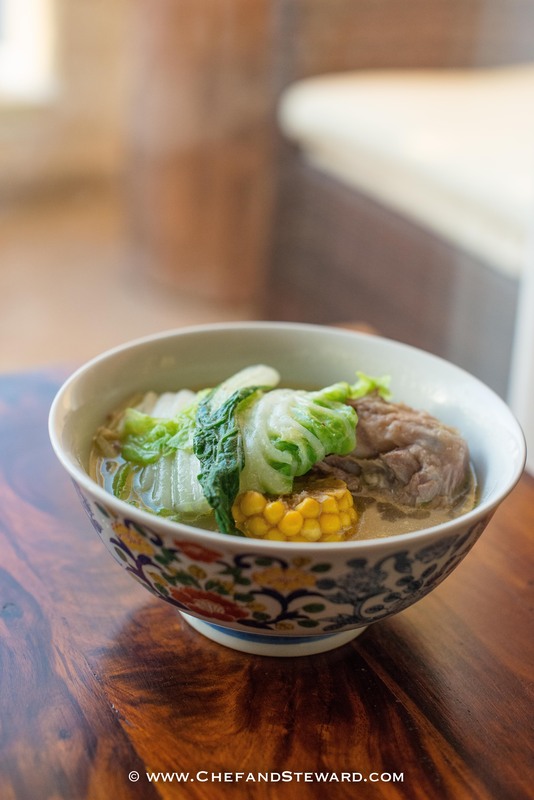 Here is a step by step recipe for one of our favourites, Bulalo Soup or Filipino Bone Marrow Broth, which is surprisingly simple and superbly tasty. We thank Ms. Georgia who happens to be a spectacular cook, for showing us the ropes. In a large stockpot, bring the beef, onions, garlic, peppercorns, patis and water to a quick boil. Skim the foamy impurities off the top when the stock starts boiling. 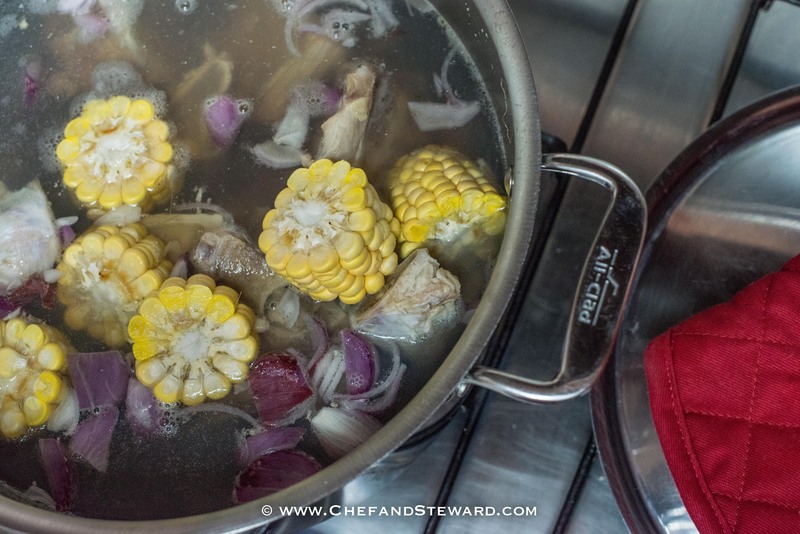 When the stock gets clear, reduce the heat to a low simmer, cover and leave to cook for 4-5 hours or 90 minutes in a pressure cooker or until the meat is very tender when pricked with a fork, falling off the bone. 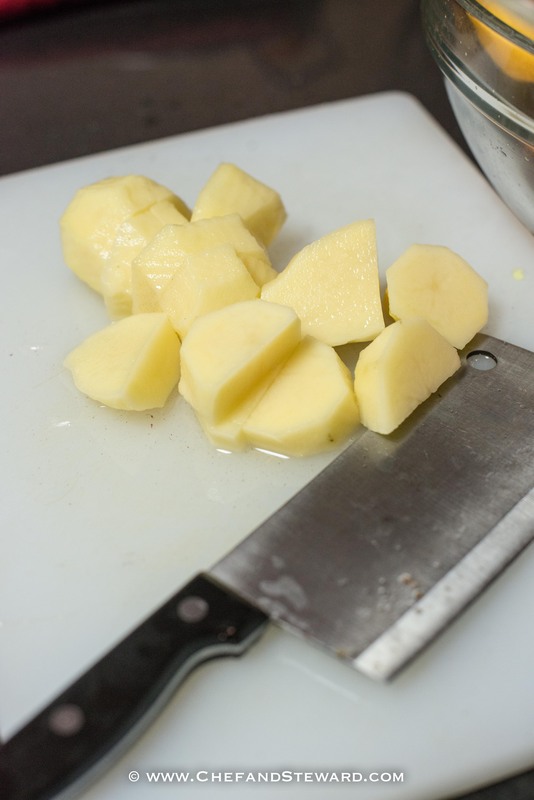 Once cooked add chunky pieces of potatoes and corn. Oonce potatoes are cooked, taste for seasoning and add salt to taste. Remove pot from heat then add the bok choi and cabbage to wilt. Serve immediately. STEWARD’S NOTE: This is a great soup to make in a big batch to conusme over time for the busy pregnant or nursing mother. With a few minor modifications, it will be superbly delicious for a few days or even months if you freeze it. 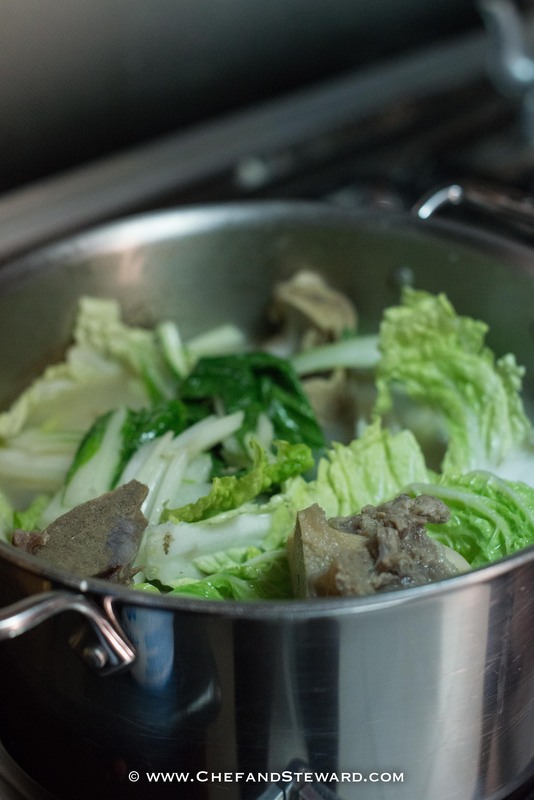 Simply leave out the cabbage and bok choy and add only when reheating, once you have brought it to a fierce boil. Add enough for however many servings you are warming up. 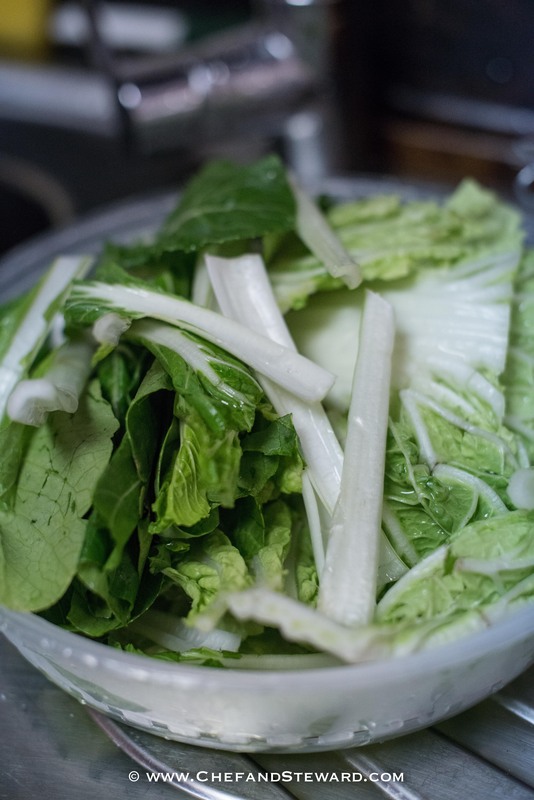 If you plan to consume it all over just a few days, wash, chop and dry the cabbage and store in a ziploc bag in the fridge to make your life easier for every reheating. Make it! Or come by and grab a bowl! Why would I want to publish articles someone else wrote for their gain on my blog? Glad to see you back…looking forward to more recipes and interesting twists and turns of life that food can take us. What happened with the 5 cloves of garlic?